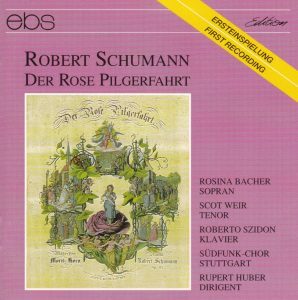 Schumann’s cantata Der Rose Pilgerfahrt (The Pilgrimage of the Rose) was composed in 1851, at the end of his life, during his ultimately unhappy stint in Düsseldorf, and when the signs of his mental illness were first starting to take their toll. It isn’t viewed as Schumann’s most inspired period, and the cantata never gained a stronghold in the repertoire, in the concert hall or on recording. It isn’t one of those oversights of posterity that it got its first recording only in 1974 (and the only one before the CD era), on EMI, although with a stellar cast of soloists assembled around conductor Rafael Frühbeck de Burgos and the Düsseldorf orchestra and chorus which were the distant successors of those who had premiered the work (see my review – link will open a new tab). But even that recording was available only off and on in the LP catalogs, and I don’t see trace of the first CD reissue from 1988 in the Schwann or Gramophone catalogs of back then, which makes me think that EMI didn’t even distribute it in the US and the UK. The poem was submitted to Schumann by Morizt Horn, a poet of only local fame, but its fairy-tale and sentimental imagery flared the composer’s imagination. It is the story of the Rose – perhaps the daughter of the Queen of the Elves, or perhaps just a rose – who requests to live the bliss and pangs of human love. Wish granted by mom, but with the condition that, as a rose, she will in the end falter and die. And so she happily does, after giving birth to the child she had with the forester’s son. The music is very lyrical, but lacks both dramatic contrasts, and the kind of melodic invention, the combination of poetry and bouncing bravado that is the typical trademark of the younger Schumann. There is much Eusebius here and little Florestan. This recording, made in 1990 (but released only in 1992) and whose main name would be Brazilian pianist Roberto Szidon, boasts being a first recording – and one must surely understand: of the version with piano accompaniment. Playing the cantata with piano accompaniment is entirely legitimate. In fact, it is arguably closer to Schumann’s original conception. He was very happy with the piano version, finding it perfectly suited to the intimacy and delicacy of the story, and it is only at the behest of friends that he orchestrated it. There’s even a letter in which he bitterly complains of the drudgery of having to return to a work which he considered finished and done with. That may be why the orchestration sounds relatively bland, much based on strings and with little contrast of colors from the woodwinds and brass. So this is not a case comparable with, say, Mahler’s Das Lied von der Erde, where playing it with piano accompaniment, as has been done, can be seen as, truly, a “reduction” of a work conceived for the full colors of the orchestra. One of the main interests of the piano version is indeed that you can hear much better… Schumann’s piano. No pun: the orchestration tends to blurr and erase the typical Schumann gestures, that suddenly become obvious when you hear them at the piano – ah… yes! Now THAT’s Schumann… The piano allows, in the more scherzando moments, for a lightness and bounce that isn’t heard in Frühbeck de Burgos’ recording of the orchestrated version. Track 12, for instance, a wedding song, acquires a character and spice that it didn’t have in the orchestrated version as conducted for EMI. It’s no coincidence then if the Ebs recording runs 56:40 to EMI’s 65. On the other hand, in the more pathetic moments, like the funeral procession (track 2 at 14:04) or Rose’s prayer (track 4), I do find the orchestral version more effective. The Stuttgart chorus sounds chamber-sized, lean and transparent, which is exactly what is needed in the piano version. 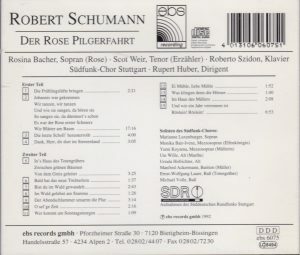 In some numbers conductor Rupert Huber attributes to full women’s chorus what the score allocates to two or three solo voices out of the choir, as in the opening movement, or again track 5 at 2:20, track 9, and track 12. Given the transparency of the voices I have no issue with it, and it is even justified by the fact that these moments aren’t attributed to individualized characters (like The Rose, or the Narrator), but just to anonymous voices. That said, in that respect and others (use of a period fortepiano), Marcus Creed’s version on Harmonia Mundi from 1999 is more authentic: he performs it as Schumann wrote it. The ebs soloists however aren’t on the same plane. Scot Weir is a fine, light lyrical tenor (and his German sounds spotless to me – Weir is an American, trained at the University of Colorado, but he was then troupe member in Wiesbaden after years spent at the Gelsenkirchen opera), but the voice lacks the element of heroism that made Theo Altmeyer’s voice on EMI so outstanding – Weir is a Don Ottavio or Basilio rather than a Tamino. Rosina Bacher sounds like a dramatic soprano, and her wails “O Tiefe Klage” (track 2 at 14:18) work to beautiful effect, but she lacks the childish and radiant quality of Helen Donath on EMI, the voice sounds a bit too mature. The solo altos and bassos, from the choir, are fine – here, the matronly quality of the altos is in situation. Still, if choice is for the piano version, and playing on period fortepiano isn’t a detrimental factor to you ears, the soloists of the Harmonia Mundi version – Christiane Oelze as Rose, Werner Güra narrator and Hanno Müller-Brachmann the gravedigger, are preferable. The work is set out in two parts and 24 numbers, each part running more or less continuously. Ebs’s cueing is not sufficient in Part 1. The long track 2 (17:16) should have been cued far more, and at least at 2:53, 7:02, 9:33, 10:31 and 14:04. As in the EMI recording, text is provided but no translations, which would be a major impediment for audiences not familiar with German. There again, on both accounts, Harmonia Mundi’s recording is preferable. But fortunately, in the Internet era, there is no problem that doesn’t find… a translation.